Robert Witherbee "Bob" Worthing was born March 8, 1918, in East Cleveland, Cuyahoga Co., OH, and died December 22, 1998, in Oklahoma City, Oklahoma Co., OK, at age 80. Buried in Rose Hill Burial Park, Oklahoma City, Oklahoma Co., OK. He is the son of Archibald Garfield Worthing of Leroy Twp., Dodge Co., WI, and Exie Lillian Witherbee of Hazel Green Twp., Grant Co., WI. Olive Wilma Larson was born December 4, 1917, in Pittsburgh, Allegheny Co., PA, and died October 8, 1987, in Oklahoma City, Oklahoma Co., OK, at age 69. Buried in Rose Hill Burial Park, Oklahoma City, Oklahoma Co., OK. She is the daughter of Walter Emanuel Larson of Farmington Twp., Waupaca Co., WI, and Helen Frazer of Pittsburgh, Allegheny Co., PA.
Robert Witherbee "Bob" Worthing (age 23), a bachelor, and Olive Wilma Larson (age 23), a maiden, were married October 18, 1941, in Wilkinsburg, Allegheny Co., PA.
Carol Anne Worthing: Born November 17, 1943, in Cambridge, Middlesex Co., MA. Married after 1964 to James Robert "Jim" Boren: Born May 2, 1943, in Norman, Cleveland Co., OK; Died February 24, 2007, in Corpus Christi, Nueces Co., TX (age 63). Buried in Houston National Cemetery, Houston, Harris Co., TX. Barbara Jean Worthing: Born June 17, 1946, in Unknown. Married (1) about 1966 in Oklahoma, to Jerry Earl Joren: Born about 1946 in Unknown. Divorced. Married (2) June 13, 1988, in Bethany, OK, to Dannie Lee Lamb: Born January 22, 1945, in Dodge City, Ford Co., KS. Robert Larson "Bob" Worthing: Born August 14, 1951, in Unknown. Married to Paula Kay Unknown: Born August 5, 1951, in Unknown. Patricia Sue "Patty" Worthing: Born July 2, 1954. Married April 30, 1983, in Solano Co., CA, to John Frank Esperance: Born August 1, 1954, in Yolo Co., CA. 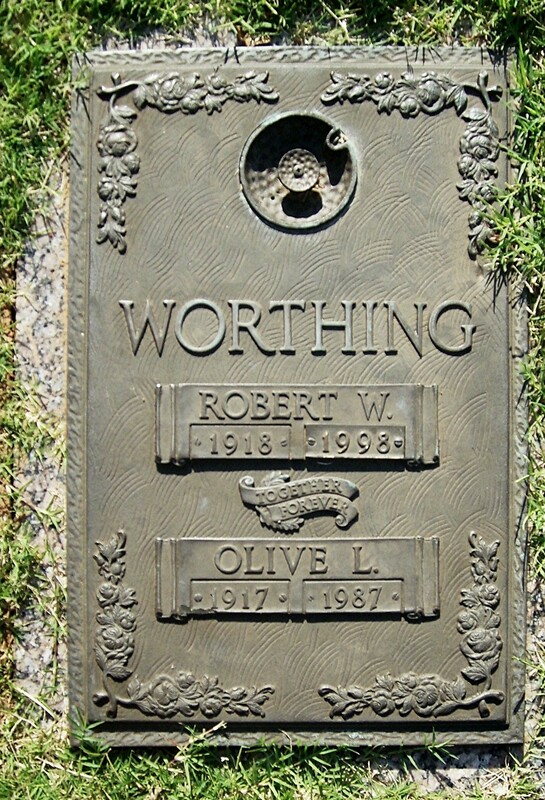 Robert Witherbee "Bob" Worthing and Olive Wilma Larson are buried in Rose Hill Burial Park, Oklahoma City, Oklahoma Co., OK. Thanks to Find-A-Grave for making this image available. 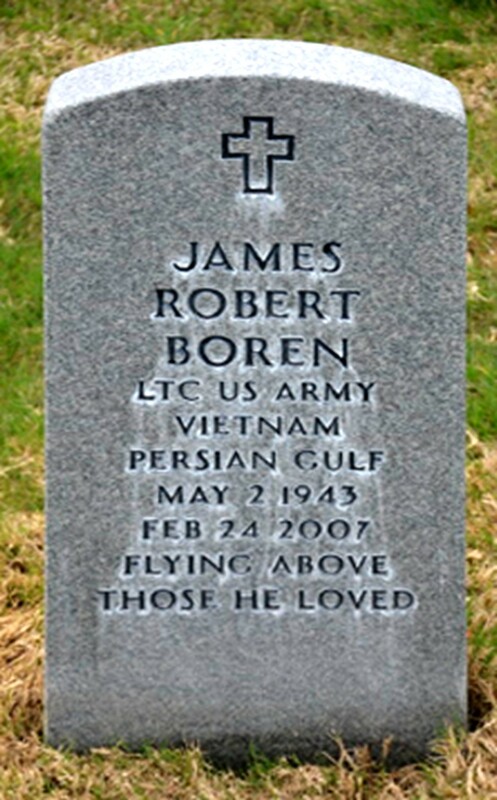 James Robert "Jim" Boren is buried in Houston National Cemetery, Houston, Harris Co., TX. Thanks to Find-A-Grave for making this image available. The 1850 U. S. Census taken on August 21, 1850, shows William Worthing Jr. (age 24) born in Wales is a Farmer and is living in Oakfield Twp., Fond du Lac Co., WI. Living with him is Emeret Worthing (age 19) born in Wales, who is Keeping House. Also living there is William Worthing (age 1) born in Wisconsin. The 1860 U. S. Census taken on August 23, 1860, shows Wm. Worthing (age 34) born in Wales with real estate of $4,000 and personal estate of $1,000 is a Farmer and is living in Oakfield Twp., Fond du Lac Co., WI. Living with him is his wife, Emaret Worthing (age 28) born in Ohio. Also living there are the following children, all born in Wisconsin: Wm. Worthing (age 10); Frank B. Worthing (age 8); Arthur A. Worthing (age 6); and Fred A. Worthing (age 4). The 1870 U. S. Census taken on August 3, 1870, shows William Worthing Jr. (age 44) born in Wales with real estate of $13,000 and personal estate of $2,000 is a Farmer and is living in Oakfield Twp., Fond du Lac Co., WI. Living with him is Emerette Worthing (age 38) born in Ohio, who is Keeping House. Also living there are the following children, all born in Wisconsin: William B. Worthing (age 20); Frank B. Worthing (age 18); Arthur J. Worthing (age 16); and Fred A. Worthing (age 14). Also living there is a Domestic Servant: Mary Bush (age 18) born in England. The 1880 U. S. Census taken on June 4, 1880, shows Arthur Worthing (age 26) born in Wisconsin to Wales and Massachusetts-born parents is a Farmer living in Leroy Twp., Dodge Co., WI. Living with him is his wife, Loella Worthing (age 23) born in Wisconsin to New York and Pennsylvania-born parents, who is Keeping House. Also living there are his two children, both born in Wisconsin to Wisconsin-born parents: Irvin Worthing (age 4); and Guy Worthing (age 2). A Servant also lives in the household. The 1900 U. S. Census taken on June 21, 1900, shows Arthur Worthing (age 46) born May 1853 in Wisconsin to Welsh and Ohio-born parents is a Stock Shipper renting his home and is living in Oakfield Twp., Fond du Lac Co., WI. Living with him is his wife of 26 years, Lowela Worthing (age 43) born April 1856 in Wisconsin to New York and Pennsylvania-born parents, with 5 of the 6 children born to her still alive. Also living there are his two unmarried children, both born in Wisconsin to Wisconsin-born parents: Flora L. Worthing (age 12) born July 1887; and Hugh O. Worthing (age 10) born October 1889. A Servant also lives in the household. A Servant also lives in the household. The 1910 U. S. Census taken on April 30, 1910, shows Archie G. Worthing (age 29) born in Wisconsin to Wisconsin-born parents has no occupation who rents his home and is living at 1302 Packard Street, 7th Ward, City of Ann Arbor, Washtenaw Co., MI. Living with him is his wife of 4 years, Exie L. Worthing (age 29) born in Wisconsin to Wisconsin-born parents. Also living there is his daughter, Marion Worthing (age 3/12) born in Michigan to Wisconsin-born parents. A Servant (age 14) also lives in the household. Olive Wilma Larson was born December 4, 1917, in Pittsburgh, Allegheny Co., PA.
Robert Witherbee "Bob" Worthing was born March 8, 1918, in East Cleveland, Cuyahoga Co., OH. The 1920 U. S. Census taken on January 5, 1920, shows Walter E. Larson (age 31) born in Wisconsin to Swedish-born parents is an Engineer at a Manufacturing Company who is renting his home at 579 East End Ave., 14th Ward, City of Pittsburgh, Allegheny Co., PA. Living with him is his wife, Helen Larson (age 27) born in Pennsylvania to Irish and Pennsylvania-born parents. Also living there is his daughter, Olive W. Larson (age 2) born in Pennsylvania to Wisconsin and Pennsylvania-born parents. The owner of the house is also living there, a widow who should be Helen's mother: Elizabeth Frazer (age 52) born in Pennsylvania to Pennsylvania and Irish-born parents. Living with Elizabeth is her son Rees B. Frazer (age 17) born in Pennsylvania to Irish and Pennsylvania-born parents, who is an unmarried Clerk at a Steel Company. 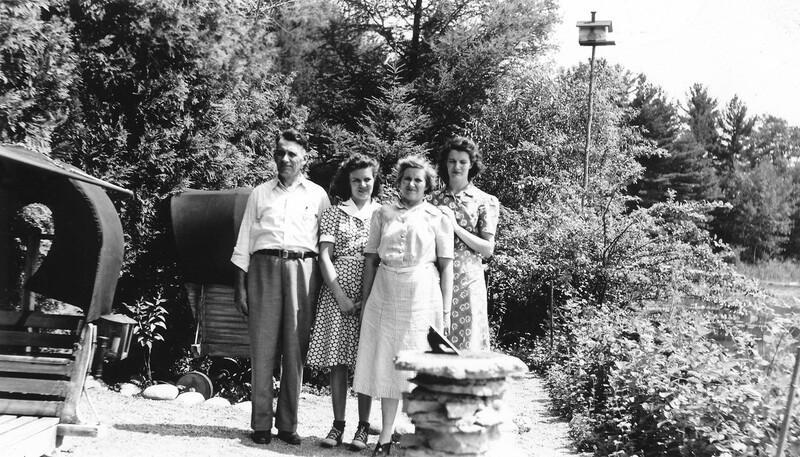 Living in the Frazer household are two unmarried nieces: Elizabeth W. Palmer (age 22) born in Pennsylvania to Canadian and Pennsylvania-born parents who is a Stenographer at a Laboratory Company; and Minnie Palmer (age 17) born in Ohio to Canadian and Pennsylvania-born parents, who is a Check Girl at a Telegraph Company. The 1920 U. S. Census taken on February 4, 1920, shows Archie G. Worthing (age 38) born in Wisconsin to Wisconsin-born parents is a Research Lab Physicist who owns his home free of a mortgage and is living at 15006 Terrace Rd., 4th Ward, City of East Cleveland, Cuyahoga Co., OH. Living with him is his wife, Exie Worthing (age 38) born in Wisconsin to Wisconsin-born parents. Also living there are his three children, all born to Wisconsin-born parents: Marion Worthing (age 10) born in Michigan; Helen Worthing (age 4-4/12) born in Ohio; and Robert Worthing (age 1-10/12) born in Ohio. The 1930 U. S. Census taken on April 14, 1930, shows Walter E. Larson (age 41) born in Wisconsin to Swedish-born parents and first married at age 28 is a Mechanical Engineer at Jaels Manufacturing Company owning his home valued at $12,000 at 914 Milton St., 14th Ward, City of Pittsburgh, Allegheny Co., PA. Living with him is his wife Helen Larson (age 37) born in Pennsylvania to Irish and Pennsylvania-born parents and first married at age 24. Also living there are his two daughters, both born in Pennsylvania to Wisconsin and Pennsylvania-born parents: Olive W. Larson (age 12); and Betty E. Larson (age 9). The 1930 U. S. Census taken on April 2, 1930, shows William Worthing (age 49) born in Pennsylvania to Pennsylvania-born parents and first married at age 24 is a University Professor owning his own mortgaged home valued at $22,000 and is living at 1372 Sheridan Ave., 11th Ward, City of Pittsburgh, Allegheny Co., PA. Living with him is his wife Agnes G. Worthing (age 489) born in Pennsylvania to Pennsylvania-born parents and first married at age 24. 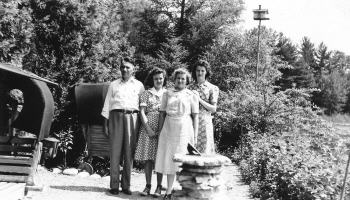 Also living at home are their three unmarried children, all born in Pennsylvania to Pennsylvania-born parents: Marion Worthing (age 19); Helen Worthing (age 13); and Robert Worthing (age 11). The 1940 U. S. Census taken on April 16, 1940, shows Walter E. Larson (age 51) born in Wisconsin, and 5 years ago was living in the Same House, and with 4 years of College, is a married Mechanical Engineer at a Railroad Equipment Factory, and who owns his home valued at $8,500 and is living at 914 Milton St., 14th Ward, City of Pittsburgh, Allegheny Co., PA. Living with him are: his wife, Helen F. Larson (age 47) born in Pennsylvania, and 5 years ago was living in the Same House, and with 4 years of College; his unmarried daughter, Olive Larson (age 22) born in Pennsylvania, and 5 years ago was living in the Same House, and with 4 years of College, a Typist of Life Insurance; and his unmarried daughter, Elizabeth Larson (age 19) born in Pennsylvania, and 5 years ago was living in the Same House, and with 2 years of College. The 1940 U. S. Census taken on April 3, 1940, shows Marion W. Worthing (age 30) born in Michigan, and 5 years ago was living in Pittsburgh, Allegheny Co., PA, and with 5 years of College, is an unmarried Economist at the National Resources Planning Board, is renting her home for $58/month, and is living at the Grevenwood Apartments, Nineteenth Street, Washington, DC. The 1940 U. S. Census taken on April 9, 1940, shows Archie G. Worthing (age 59) born in Wisconsin, and 5 years ago was living in the Same House, and with 10 years of College, is a married University Professor, and who owns his home worth $9,000 and is is living at 1372 Sheridan Ave., 11th Ward, City of Pittsburgh, Allegheny Co., PA. Living with him are: his wife, Exie Worthing (age 58) born in Wisconsin, and 5 years ago was living in the Same House, and with 3 years of College; his unmarried daughter, Marion Worthing (age 30) born in Michigan, and 5 years ago was living in the Same House, and with 9 years of College, a Statistician at the National Resources Planning Board; his unmarried daughter, Helen Worthing (age 24) born in Ohio, and 5 years ago was living in the Same House, and with 5 years of College, a Research Assistant at the National Resources Planning Board; and his unmarried son, Robert Worthing (age 22) born in Michigan, and 5 years ago was living in the Same House, and with 3 years of College, a Statistician at the National Resources Planning Board. MR. AND MRS. WALTER E. LARSON of Milton street, Regent square, announced the engagement of their daughter, Miss Olive Wilma Larson, to Robert Witherbee Worthing, son of Dr. and Mrs. A. G. Worthing of North Sheridan avenue, at a luncheon in their home. Miss Larson and her fiance are graduates of the University of Pittsburgh. They are making plans for a fall wedding. Robert Witherbee "Bob" Worthing and Olive Wilma Larson Marriage License. Robert Witherbee "Bob" Worthing and Olive Wilma Larson Marriage Record. 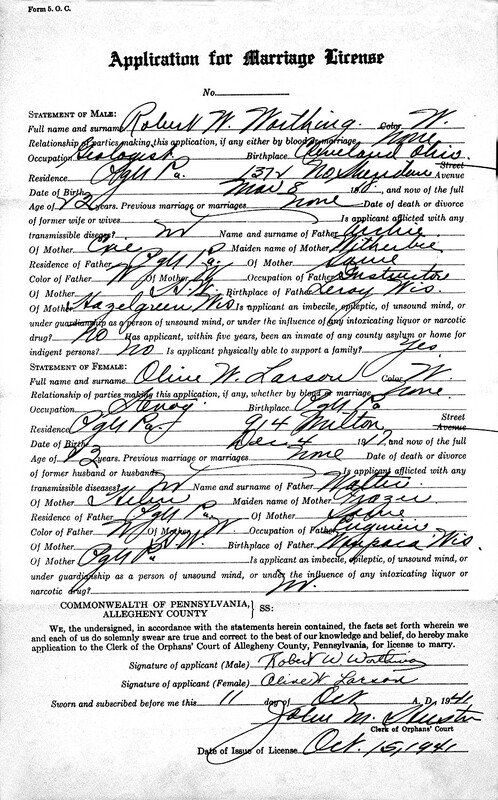 Following a trip South, Mr. and Mrs. Robert Witherbee Worthing will live in Rosedale, PA. They were married on October eighteenth, at three-thirty o'clock in Calvary Lutheran Church, Wilkinsburg. Mr. and Mrs. Walter E. Larson of Milton street, Regent Square, parents of the bride, have announced. The bride is the former Miss Olive Wilma Larson. Mr. Worthing is a son of Dr. and Mrs. A. G. Worthing of North Sheridan avenue. The wedding ceremony was performed by Dr. Albert Steinfurth. The bride wore white ballet satin, with sweetheart neck, basque waist and full skirt which ended in a brief train. Her fingertip veil fell from a tiara of orange blossoms and she carried a colonial bouquet of white chrysanthemums and white snapdragon. Miss Betty Larson, acting as maid of honor for her sister, wore peach moire, and Miss Helen Worthing, sister of the bridegroom, who was bridesmaid, wore aqua moire. They carried colonial bouquets of small chrysanthemums in autumn shades, and wore the same flowers in their hair. Daniel Bush was best man, and the ushers were John Hoop and William F. Grayburn. The bride's mother wore blue velvet, and the bridegroom's mother, blue crepe. Both had corsages of Johanna Hill roses. The wedding reception took place in the Penn Lincoln Hotel. Mrs. Robert W. Worthing, who was Miss Olive Larson, daughter of Mr. and Mrs. Walter E. Larson of Regent Square, before her marriage. Mr. and Mrs. Worthing are at home on Verona Rd., Rosedale. Olive Wilma (Larson) Worthing died October 8, 1987, in Oklahoma City, Oklahoma Co., OK, at age 69. Buried in Rose Hill Burial Park, Oklahoma City, Oklahoma Co., OK.
WORTHING, Olive Larson, born in Pittsburgh Pa., a longtime resident of OKC, died Thursday. She was a long-standing member of May Ave. United Methodist Church. Mrs. Worthing was a loving and caring wife and mother with a strong faith in God and we will miss her. She is survived by her husband, Robert, of the home; 4 children, Carol Boren, Corpus Christi, Tx., Barbara Joern, OKC, Bob Worthing, Baltimore, Md. and Patricia Esperance, Montara, Ca. ; sister, Betty Steele, Sacramento, Ca. and 5 grandchildren. The family suggests memorials may be made to Cancer Research. Services will be Monday, 2pm, at the May Ave. United Methodist Church with interment at Rose Hill Cemetery. Under the direction of Hahn-Cook/Street and Draper. Robert Witherbee "Bob" Worthing died December 22, 1998, in Oklahoma City, Oklahoma Co., OK, at age 80. Buried in Rose Hill Burial Park, Oklahoma City, Oklahoma Co., OK.
WORTHING Robert Witherbee, 80, a resident of Oklahoma City since 1948, joined the Lord December 22nd. He was born in Cleveland, Ohio on March 8, 1918, to Exie Lilian Witherbee and Archie Garfield Worthing, and grew up in Pittsburgh, Pennsylvania. He attended the University at Pittsburgh where he met his beloved wife, Olive Wilma Larson. He then undertook graduate studies in geology at the University of Wisconsin in Madison. He moved to Oklahoma City as a geologist, a profession he loved, and where he and Olive raised 4 children, Carol, Barbara, Bob, and Patty. He was an active member of the Geological Society, and long-time member of the May Avenue Methodist Church. He was preceded in death by his wife Olive, and sister Marion. He is survived by his sister, Helen Worthing of Chevy Chase, Maryland; his children, Carol and Jim Boren of Corpus Christie, TX, Barbara and Dannie Lamb of OKC, Bob and Paula Worthing of Severna Park, Maryland, and Patty and John Esperance of Denver, Colorado; and 5 grandchildren. The body can be viewed at Hahn-Cook/Street & Draper Funeral Home. Funeral services will be at May Avenue Methodist Church at 10:00 AM Tues. Dec. 29th. In lieu of flowers, donations can be made to the American Cancer Society or the ASPCA. PITTSBURGH. Dr. Archie Garfield Worthing, 68, nationally known physicist, died unexpectedly. A professor of physics at the University of Pittsburgh since 1925, Dr. Worthing had obtained prominence for his work in high-temperature measurement. He was co-author of "Properties in Tungsten," a book used in the electrical industry. Irvin A. Worthing, Fond du Lac county insurance and real estate dealer, died following a heart attack at 11:30 a. m. on Wednesday while visiting one of his farms near Oakfield. He was the brother of Dr. Hugh Worthing of Sheboygan. Other survivors are two daughters, Mrs. Alice Kleinert of Chicago and Mrs. Nellie Bird of Oakfield; two grandchildren; Dr. Worthing and another brother, Archie Worthing of Pittsburgh, Pa. The deceased was a member of the Oakfield Masonic lodge No. 158 for 50 years and last Tuesday the organization paid tribute to him, presenting a 50-year certificate of membership. He had been engaged in farming for several years prior to his retirement in 1911. He then moved to Oakfield and developed an insurance and real estate business. He was born September 21, 1875, in Dodge county. Funeral services will be held at 2 p. m. Friday at the residence. Burial will be made at Mount Pleasant cemetery. Marion Witherbee Worthing was born January 7, 1910, in Ann Arbor, Washtenaw Co., MI. Marion Witherbee Worthing, 73, a retired Foreign Service officer who was treasurer of the Unitarian Universalist Women's Federation, died of cardiac arrest Sept. 5 at Sibley Memorial Hospital. She had a brain tumor. Miss Worthing, who lived in Chevy Chase, was born in Ann Arbor, Mich. She graduated from the University of Wisconsin and took a master's degree at the University of Pittsburgh. She moved to Washington during World War II and worked for the War Production Board. She joined the State Department after the war. She specialized in international trade of nonferrous metals and related matters. Her foreign assignments included Paris, where she was first secretary of the U.S. embassy from 1957 to 1962. She retired in 1970. Miss Worthing was a former chairman of the investment committee of the Unitarian Universalist Association and the board of trustees of the Cedar Lane Unitarian Church. She also was a member of the International Club and the Chevy Chase Woman's Club. Survivors include a sister, Helen Worthing of Chevy Chase, and a brother, Robert Worthing of Oklahoma City. Mr. Joern has been practicing as a PA for 29 years. He feels that the board should address the ability for PAs to work in emergency events both on a local & national level in a crisis and funding for PAs. Mr. Joern brings to the board his many years of experience as a PA. He has practiced in Occupational Medicine and has military experience; RTO, CTC, USANG and overseas experience treating patients in 4 countries. James Robert "Jim" Boren died February 24, 2007, in Corpus Christi, Nueces Co., TX, at age 63. Buried in Houston National Cemetery, Houston, Harris Co., TX. James was born on May 2, 1943 and passed away on Saturday, February 24, 2007. Jim grew up in Norman, OK. He was adored by his younger sister Karen (that's me) and by all who knew him. My favorite memory of Jim was when he bought his first car, a 1952 Nash Rambler convertible with a white rag top. Jim wanted that car to be perfect. Noticing there was some mildew on the rag top, he went into the house and came out with a bottle of bleach. He put the bleach on full strength. He was so proud and made us all come out and look at the startlingly white roof. Next morning when he came out to drive to school, he was aghast when he looked at his beautiful white roof, which now had holes eaten into it by the bleach! It was a very funny day for us all. He left behind a wife, Carol, two daughters Laura and Lannette, and a grandson, Reece. Hello there Borens! It is so strange to see people with my last name. It is just uncommon enough that, growing up, I always felt that "Boren" belonged only to my family, a feeling I'm sure many Borens out there share. My father is James Robert Boren of Texas, but originally from Norman, Oklahoma. His father, my grandfather, was also named James Robert Boren, AKA J.R. I know very little about this part of my family. I heard once that the name Boren was Scottish, but do not know if this is true. If there is indeed a Borensberg in Sweden, is it Swedish?? I am 1/8 Swedish, but from my mother's side. I was not aware of any Swedish blood coming from the Boren ancestry. I'd love to learn more about my name.